After just 24 hours of taking electronic orders for the first Russian hybrid cars, the Yo-auto company received around 55,000 bids – more than the company had initially planned to issue during the first year of production. The modular hybrid vehicle, developed by Russia’s third-richest man Mikhail Prokhorov, the head of the Oneksim Group, has shown a record demand within the country even before the official start of production. The construction of the motorcar factory will get underway near St. Petersburg on July 8, with the first cars expected to roll of the production lines in 2012. Currently the Yo-auto company is offering three car models – a crossover, a 5-door hatchback and a van, with the first one being the most popular (82 per cent of orders). The cars’ prices range from $10,000 to $15,000. Among other options, they are equipped with climate- and cruise-control systems, GLONASS/GPS navigation system, remote starting and engine stoppage system and 3G-internet. 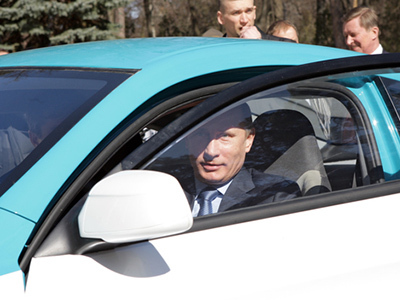 The car, already test-driven by Prime Minister Vladimir Putin, is expected to become a good rival for the Japanese and European cars of that segment. Most of the Yo-mobiles will be both fuel and gas driven, which makes them ecologically friendly. 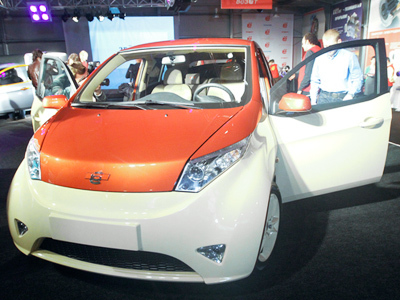 The developers say that Yo’s average fuel consumption is about 3.5 liters per 100 kilometers. The car, which has a maximum speed of 120 kilometers per hour, can go 400 kilometers on a single tank of gas.